Bill McCoy Insurance gave me more coverage, removed a gap in my coverage, and still saved me $650! They not only achieved more than I expected; I was very satisfied with their service. 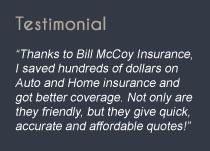 Bill McCoy Insurance Agency received a rating of 5.0 out of 5 based on 1 review on IWantInsurance.com.